The company behind Blackpool's Funny Girls bar has gone into administration. Owner Basil Newby, who has run venues in the seaside resort for nearly 40 years, said he was taking time out for health reasons. Blackburn-based Thwaites Brewery confirmed it has taken over the drinks licence for the cabaret showbar and four other venues in Blackpool. Thwaites said the move would protect about 100 jobs and it was "business as usual" at Funny Girls. 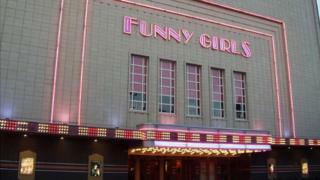 Blackpool Council confirmed the firm that runs Funny Girls, which opened in 1994, had gone into administration. A Thwaites spokesperson said: "Funny Girls has been an iconic part of Blackpool's night-time economy for a long time and we will make sure it stays that way." "Our licence will allow the Funny Girls outlets to operate without disruption for the next few months and together with Basil we will resolve issues," the spokesperson added. "As far as we are concerned, it's business as usual and customers should see no difference." Mr Newby, from Poulton-le-Fylde, opened his first club Flamingo in Blackpool in 1979. He received an MBE in the Queen's New Year Honours list in 2014.